Contains high antioxidant level of 8.95% vs 5-6% for mass-market teas. Character: A green tea with surprising body and an intense but captivating floral taste not found other natural teas. This Jasmine is an exceptionally well-made tea. The leaves have a very tight and wiry roll with an over abundance of white mottled tips. The 'tippy' nature of the tea signifies a superior tea. 'Tip' is only possible when the estate practices fine plucking and a 3 or 4 day plucking rotation. The mottled effect is from teas that are plucked in the first 2-4 weeks of the new season when the days are warm but the night temperatures are piercingly cool. The quality of this exceptional Jasmine evokes adjectives such as complex, subtle and mystery from long-unopened jewelry boxes. 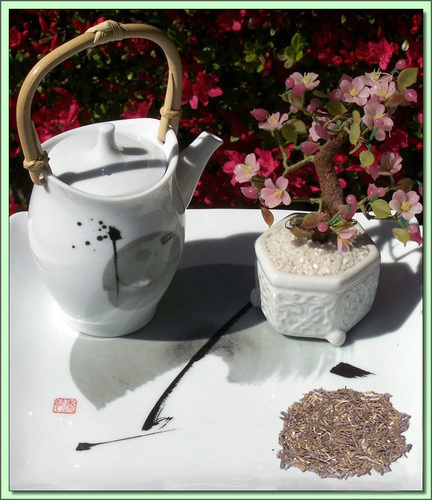 After the blossoms are layered between the fine green teas, slightly warmed air is drawn through the layered tea. The delicate fragrance of the blossoms impart itself on the tea. Interestingly Jasmine blossoms are used about 9 times. It is only during the 2nd use of the Jasmine blossoms that this tea made. This tea has virtually no flower petals, an additional sign of superb quality.